As was more than hinted at in the spoof Casino Royale earlier in the year, the gadget bound 007 movies were ready for a re-boot. New director Lewis Gilbert, armed with a Roald Dahl screenplay, saw to it that the most exotic of locations, sweeping vistas and highly evolved evil doer hideaways, would be new way forward. There was a relatively light touch with the gadgets and a template for a fair few more Bond movies to follow, was born. A safe cracking, decoding machine. Pop it on the safe, spin the dial around right, then left, then right etc., it will stop at the appropriate numbers. Hey Presto. Sadly, a loud and noisy alarm springs into action and the game is up. Doh. Perhaps a little surprisingly, it's the one movie gadget that has raced ahead of itself. Safe Cracking machines have been used in numerous films, but they do not exist. Perhaps 007 is partly to blame, because of the many devices we have seen, this is one the general viewing public would perhaps presume 'must' exist. It doesn't. That isn't to say safes cannot be cracked. Indeed, methods include: Physical lock manipulation, guessing the combination (people do use the default manufacturer's code or birthday numbers!) and weak point drilling. You can scope a safe, by drilling a hole and putting in a camera to view what can be worked on, but the nearest to the movie safe cracking machine would be an Auto Dialler - although these can only be made to work with one type of machine; each is different. 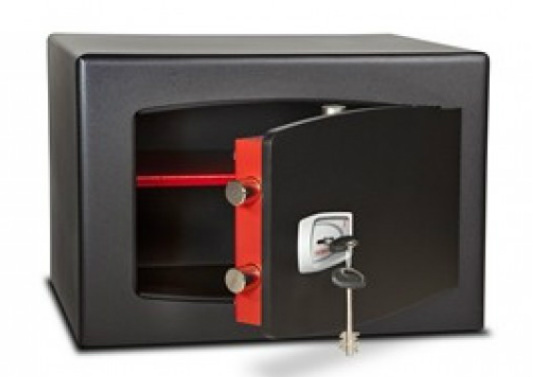 This £295 Best Buy Safe is just one of hundreds that are available at the store below, whose range includes home security safes, gun safes, fires safes, key cabinets and lockers. Click on the link below to read more.